Cyclists in Brussels are being treated to a free breakfast on Thursday - and free lights to help them stay safe after the clocks go back this weekend. The regional government's Bike For Brussels campaign is behind the initiative, which aims to encourage more cyclists to continue riding during the winter months while also raising awareness of the importance of good visibility. The free breakfasts are being handed out from 7.30 at four Brussels mainline rail stations - North, Central, Midi and Luxembourg - as well as the VUB and ULB university campuses. Other locations include Porte de Ninove, Wiener (Watermael-Boitsfort), Belgica (Jette), Albert (Forest) and the Barrière de Saint-Gilles. "Cycling in Brussels is booming," says Bike for Brussels. "And we love the fact that you stay on your bike during winter time. "However, 21% of cyclists still ride without a bike light. This becomes extra dangerous at the end of the year, as darkness comes an hour earlier due to winter time. "You might think you’re visible in the city lights, but you’re not. That’s why you should always ride with a bike light, because you’re good looking, but only if we can see you." 21% is a joke: it’s at least 70%. And... “You should ride with a bike light”? No! You MUST ride with a bike light; it’s the LAW. A lot of cyclists are a danger to themselves in the first place! 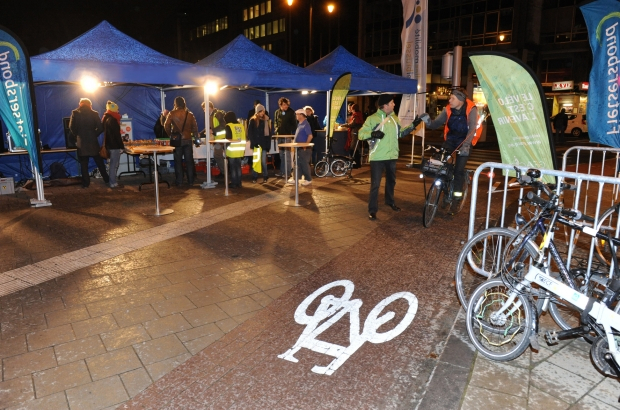 Not only are bike lights essential - a high visibility vest is a must!